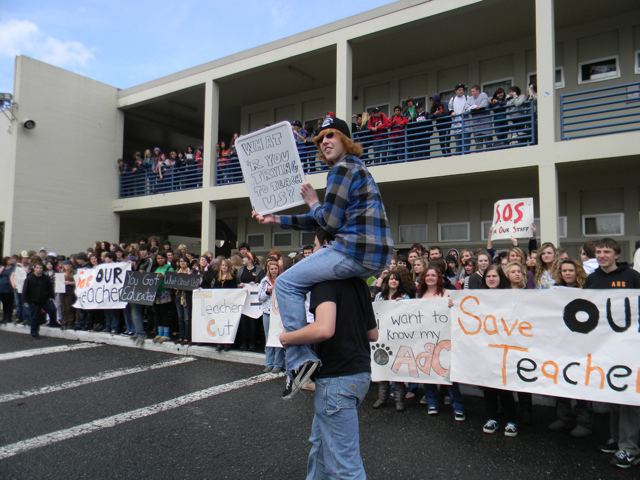 ARCATA HIGH SCHOOL –On March 18 at 2 p.m., during fifth period, more than 200 Arcata High students left their classrooms and protested in front of Arcata High against the recently announced budget cuts. Some students wore orange and black, others held up signs and they all united in fiery cheers against the cuts. “We’re protesting because we’re frustrated with the fact that our teachers are the first thing to go,” AHS senior and ASB board commissioner Wylan Simpson said. That night, they attended the Northern Humboldt Union High School District board meeting, where about 20 students rose to speak to the board members in defense of their teachers. The next day, word spread of the nationwide walkout for Friday March 11 at 2 p.m., inspired by recent events in Wisconsin. Many students planned to participate, but the tragedy of the March 11 Japanese earthquake and the resulting tsunami warning interfered with their plans as Arcata High School enrollment had dropped to less than half their student population that day. Gathering their wits, students reorganized and replanned their walkout on Friday the 18th. Teachers and administration were aware of the walkout. “The walkout is in support of us. I personally have no objection to it with the exception of the loss of teaching time in my classroom,” an anonymous Arcata High teacher stated. That day, the administrators sent out notes warning the students that if they participated in the walkout, that disciplinary action would follow. Regardless, at two o’clock, two hundred students walked out and stood in front of the school for 20 minutes. “I want to support our teachers. We’re your future, we’re our future. We’re the ones that are going to be taking care of this place next,” AHS sophomore Sage Fanucci stated as she stood outside with her friends at 2 p.m. When the bell for the passing period to sixth rang, everyone went back to class. The walkout itself was peaceful and organized. But a couple steps away from the walkout, the AHS main office was in chaos. Administration, secretaries and office aides were in a frenzy to find out attendance and bring the walkout situation back under control. Arcata High administration is currently in the process of handing out disciplinary action for the students who participated in the walkout. Using teacher reports on attendance, they are sentencing students who walked out on Friday lunch detentions this Wednesday, March 23. Lunch detentions are usually served in the office, but the numbers for this particular detention session are so high that they will be served in the gym. This entry was posted on Friday, March 25th, 2011 at 3:36 pm	and is filed under News. You can follow any responses to this entry through the RSS 2.0 feed.